STANDARD - This is the most commonly used grip on most decks. Used for carving, cruising and mellow rides. A rider can also ride barefoot with this grip without tearing up the feet. MEDIUM - Medium is a great option for those riders that are doing more advanced tricks and that are doing some aggressive speed carving and sliding. 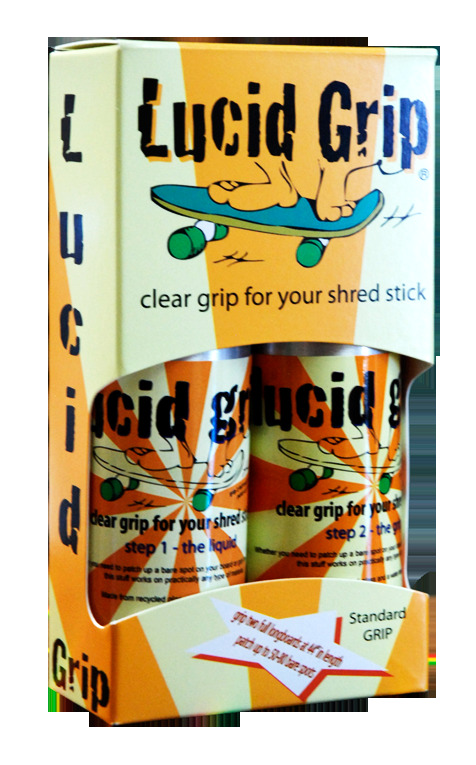 Lucid Grip is a two part application and takes approx. 30-40 minutes to dry. For more help watch our video on how to apply Lucid Grip. Precision 8mm axel holes with Black rubber seals to keep dirt and debris on the outside of the bearing. With .4045" built in spacers, changing your wheels has never been easier! The Y tool is a 3 in one tool that features a socket for the Axle nut, Kingpin nut and Mounting hardware nuts. It also comes equipped with a Phillips head and allen head tool for mounting hardware screws. This is the perfect tool for fixing up your longboard. Phillips head and Allen head tools also included.